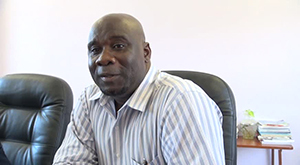 NIA CHARLESTOWN NEVIS (September 01, 2014) –Minister responsible for Natural Resources on Nevis Hon. Alexis Jeffers, expressed appreciation to the Organization (OAS) of American States for its continued efforts in the area of geothermal development. He made the comment at the end of a meeting at the Nevis Island Administration (NIA) conference room, to discuss the status of the geothermal development project with Sherry Tross Executive Secretary for Integral Development at the OAS who was accompanied by OAS representative for St. Kitts and Nevis Terence Craig when they visited Nevis on August 29, 2014. “Nevis has adopted the policy that we are going to try to do our best to make Nevis wholly…green in terms of our dependence on renewable energy instead of fossil fuel.We have had assistance from the OAS over the years and we certainly appreciate their effort in ensuring that we…had work done on geothermal, in terms of geothermal contract, geothermal power purchase agreement and getting us to where we were at one point, as being the leader in the thrust towards the development of geothermal energy. “We are still pursuing that goal of bringing geothermal to fruition and the OAS certainly remains recommitted towards ensuring that the partnership continues towards that goal,” he said. Mr. Jeffers also noted that the Nevis Island Administration would do all it could to ensure the continued partnership it enjoy with the OAS. “We certainly want to ensure that the partnership continues with the OAS and I have made the commitment that we will certainly develop stronger ties in the relationship and keep you informed as to what we are doing here on the island of Nevis with respect to renewable energy. “I mentioned wind energy before, I mentioned our recent developments in waste to energy and also solar. So those would complement geothermal in the near future, we are hoping, over the next couple of years,” he said. “The OAS feels very strongly about its commitment to working with its member states, in terms of moving forward their development agenda and in this case, since we are talking about the issue of energy, and particularly for Nevis geothermal energy, and the initiative that we have been working on with you for several years. We certainly want to see that come to fruition. “We believe very strongly, that as we are moving forward we really have to develop a sustainable development agenda that really gives countries the opportunity to grow. That gives countries the opportunity to provide and create jobs for their local communities but that also has a forward looking perspective, in that, what we are doing today, really is going to have serious and important and significant implications for the future and will in no way injure what we will leave behind for future generations,” she said. The Senior OAS Official described Nevis’ thrust in geothermal development as visionary and one her organisation would assist with and reminded that she would listen to any concerns related to the project. “I think what we are doing with geothermal energy is visionary to the extent that we at the OAS can be supportive in terms of helping move this forward. We are certainly there to accompany you. We have been there with you from the very beginning and now as you put new efforts and emphasis and new focus into moving this forward, we also want to accompany you in that process. “Our Director here in the OAS office is here on the ground. If there are any concerns you wish to share with him, he is there for that but I am always a phone call away. That’s the good thing about technology now. We are all next door neighbours. You know that we have the ear of the Executive Secretary going into development and certainly, I feel very strongly about wanting to support what’s happening in St. Kitts and Nevis and in this particular case, what’s happening in Nevis. I am there. Please feel free to reach out,” she said. Notwithstanding, Secretary Tross stated that she would continue to follow up with the NIA to see how they could work together. “At the end of the day, my job at the OAS, is to work with countries and help them to realise their development goals, their development priorities and do this in an effective way, in an efficient way and one that is sustainable, in terms of its focus and inclusive in its orientation and I think that we have all of those elements here. So thank you again and I look forward to our continued work together,” she said.